Play Meets Math – What Happened to Kindergarten? Play is recognized as an important vehicle for developing all aspects of a child in kindergarten because it provides a functional and meaningful setting for appropriate development. Incorporating games and dramatizations into a kindergarten mathematics curriculum is associated with better academic skill development and conceptual thinking. This article tells how a teacher tries to create a playful math curriculum. In many schools across the nation, kindergarten has become a very rigid environment leaving little to no time for children to explore learned concepts. Five-year-olds are expected to sit at a desk to participate in skill-and-drill exercises with an emphasis on monotonous homework. 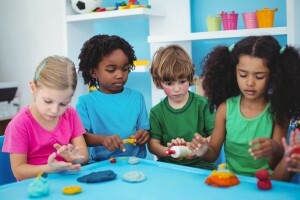 What happened to imaginative playtime? Where are the opportunities for exploration? What happened to kindergarten? As a kindergarten teacher, I was not pleased with the way my students were learning, especially when it came to math. Most students were not gaining a conceptual understanding of the material; rather students were memorizing symbols and algorithms (which frankly, meant nothing to them). Although students were able to learn mathematics in the classroom, they were unable to use the concepts in a real world setting. In 2009, the Alliance for Childhood released a report on the crisis facing kindergarten. The authors of the report stated that kindergarten had changed dramatically since the late 1980's. During that time, kindergarten classrooms often had plenty of space allocated to unstructured play, discovery, and practicing social skills. These are elements that helped children learn how to enjoy learning. Currently, children spend far more time being taught and tested on literacy and math skills than they do learning through play and exploration, exercising their bodies, and using their imaginations. Many kindergarten teachers are required to use scripted curricula which teachers are not encouraged to deviate from. Similar teaching methods violate long-established principles of child development and good teaching. The achievements made by these programs come at the expense of other skills children need to learn such as self-reliance, problem-solving, and spatial thinking (Miller & Almon, 2009). See our Kindergarten math lesson plans. Children must learn what their brains are developmentally ready to absorb (Miller & Almon, 2009). Students are unable to use the traditional classroom mathematics in the real world because they do not possess a conceptual understanding of the material (Boaler, 1998). Students are less likely to foster imaginative thought and problem-solving in this traditional and structured environment. Incorporating games and dramatizations into a mathematics curriculum allow for students to receive developmentally appropriate mathematics instruction. The incorporation of play guides the curriculum toward work that does not simply reproduce knowledge, but uses knowledge in authentic intellectual ways which tap into students' depth of knowledge - creating a deeper understanding of the content being taught. Integrating games and dramatizations into the lessons builds on students' experiences and knowledge. This kind of work supports higher levels of cognition and student engagement, and also raises students' intrinsic standards. To take matters into my own hands, I experimented with my set of students. In a small attempt to tackle this large problem, 16 kindergarten students engaged in five days of addition and subtraction practice. On the first day, traditional tasks (algorithms) and methods were utilized, students were then assessed. On the second, third, fourth, and fifth days traditional teaching and learning practices were substituted with methods of learning through play and dramatizations. At the end of the fifth day, students were assessed again. The two assessments were compared and analyzed. For the games, simple classroom supplies were used (colored construction paper, paper plates, etc.). Play tasks were derived from a project by Alison Munson O'Neil. Students learned a lesson from the textbook and completed the assigned worksheet. I then held a one-on-one meeting with each student in order to ask higher-level questions regarding the problems on the worksheet. For example, I asked students to solve real life scenarios that involved addition and subtraction. Students were asked to explain their thoughts - "Megan wants 10 crayons, but she only has 6. How many more crayons does she need?" Anecdotal records of student responses were kept. Children practiced addition and subtraction by playing Ice Cream Shop. Children were asked to pretend they were customers and cashiers in an ice cream shop. Each session had a special number of the day. Customers tried to come up with combinations of chocolate and vanilla scoops in order to win a free sundae. For example, if seven was the special number of the day, a customer could order five vanilla and two chocolate scoops. After a customer ordered, one server scooped the combination into a bowl. One cashier drew and wrote the combination on the menu until all combinations for the special sundae were found. Children were posed with the following questions: (1) How many combinations of chocolate and vanilla ice cream can the customers find for the special number of the day? ; (2) How will the workers use drawings and numbers to show the combinations on the menu for the special number of the day? Children practiced addition and subtraction by playing The Chocolate Factory. The objective of the game was for children to find a number that makes 10 when added to another number. Children were asked to pretend they were in a candy shop that sold dark and milk chocolate in boxes that held ten pieces. Students were told that an employee was missing, so they would run short on milk chocolate. Customers could order 1-9 pieces of milk chocolate and the rest had to be dark chocolate. Children were posed with the questions: (1) How will the clerk use a number line to figure out how many more dark chocolates are needed to fill up a box of ten? ; (2) How will the cashier use pictures and numbers on the receipt to show two groups of chocolate to total 10? Children practiced addition and subtraction by playing Big Five Airport. The objective was for children to add and subtract within five. Children played workers in the airport. The runway could only hold five airplanes at a time, so all the workers had to count carefully to make sure there were no more than five airplanes or else there would be accidents. The air traffic controller was in charge of calling out the number of planes and how many took off and arrived. The reporter wrote down the number of planes that took off or landed and how many were all together. Children were posed with the following questions: (1) How will the air traffic controller tell the reporter how many planes are on the runway and how many take off or arrive? ; (2) How will the reporter use numbers to show if they need to add or subtract planes? On the 5th day, I held one-on-one meetings again with my students. I asked similar real world questions as I did on the first day. 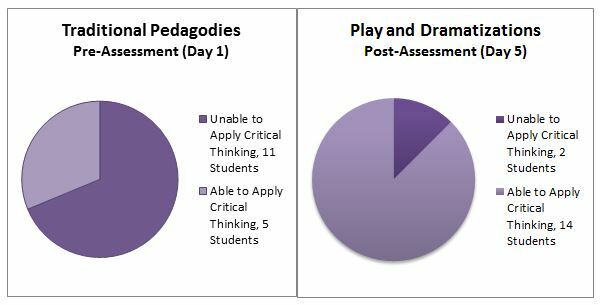 Student responses from Day 1 and Day 5 were compared. All in all, I realized that play does indeed have a place in the kindergarten classroom. The incorporation of play guided the content toward work that did not simply reproduce knowledge, but used knowledge in authentic and intellectual ways. Students were able to create deeper understandings of addition and subtraction when play was integrated. Learn more about becoming a kindergarten teacher. My name is Salpy Baharian. I have a Clear Multiple Subject Teaching Credential as well as a Master's Degree in Education, with a specialization in Curriculum and Instruction. I am the co-founder of Teacher.org and have taught kindergarten for many years. As an educator, I strive to create authentic learning experiences for students in order to motivate them to excel at their highest potential.